Ghostery Privacy Browser offers a private, fast, tracker- and ad-free mobile browsing experience. 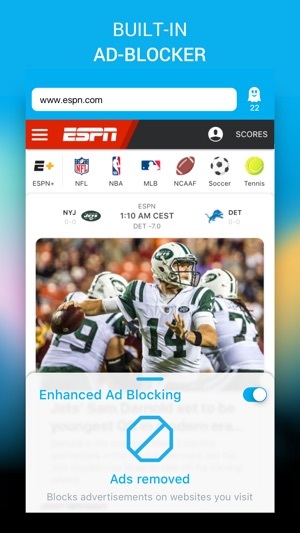 Equipped with comprehensive features that enhance user privacy for mobile browsing, the Ghostery Privacy Browser integrates the powerful ad blocking and tracker protection of the Ghostery 8 control panel with improved browser functionalities. See who is tracking your data on the websites you visit and choose to block or unblock these trackers. The browser removes intrusive ads and clutter, resulting in a cleaner and ultimately faster browsing experience. Save on time and data usage with our built-in private search, powered by Cliqz, that suggests three dynamic result cards (websites or other content) as you type in the address bar – providing smarter navigational options to get users to their destination with just one click. Cliqz does not store any personally identifiable information and works with sophisticated anonymization techniques, meaning users’ search queries remain completely private. Ghost mode offers further privacy protection by preventing the websites you visit from appearing in your browser history. Protect yourself from fraudulent websites that want to steal your passwords and account information with a built-in security feature that detects up to four times more phishing attempts than Google Safe Browsing and works considerably faster, uncovering phishing sites within an hour. - Improvements to the ad-blocking functionality. - Multiple fixes and enhancements. 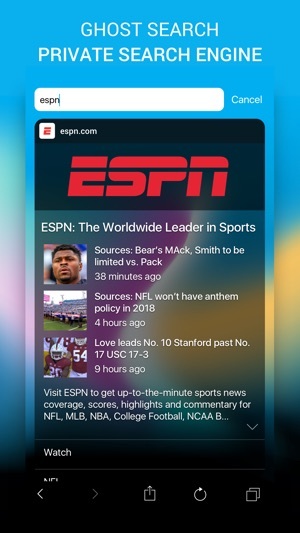 The best web browser on iOS got even better. 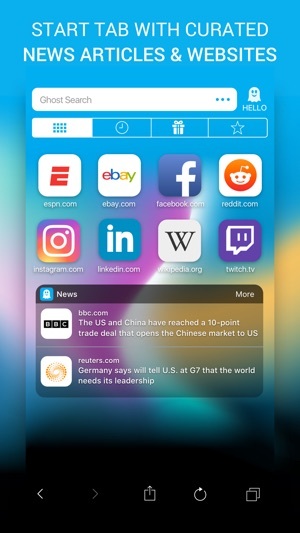 Ghostery's tracker-blocking system is the best way to take back control of your browsing, and here it is integrated into its own web browser for iOS. I do not use Safari much now that I have the Ghostery web browser. The new Reader View mode added in version 2.0, with its ability to select text size and choose between a san-serif and serif font, is a very welcome addition. 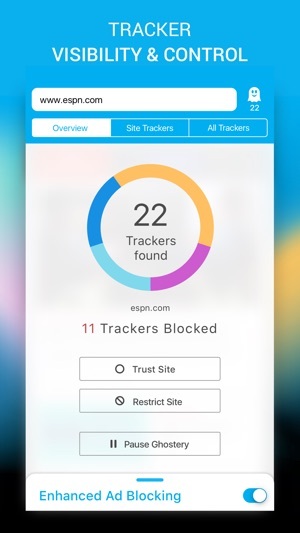 2.0 now provides detailed information about trackers and ad blocking, giving the user an easy interface for trusting the site (suspending blocking) or turning individual trackers on and off on a per-site basis. Ghostery for iOS now has a level of control like the Ghostery plug-ins for desktop browsers on Mac and Windows. I haven’t had many problems using the app so far, but there’s some stuff that I’d still like to see that was present before the update. Thanks for the feedback. If you'd like to reach out to us with questions or concerns, feel free to email us at support@ghostery.com.